For years I wrote a most enthusiastic Seattle Times column every July or so praising one of my very favorite white wine grapes, Sauvignon Blanc. All my non-NW wine reviews (California, other New World, and European wines) now appear exclusively on this blog, and I encourage importers and distributors, as well as wineries, to keep in touch so that I may continue to serve readers with a global perspective. It is my unshakeable belief that Washington and Oregon wines are world-class, but they must always be considered in reference to other world-class wines. So here’s a look at some excellent West Coast Sauv Blancs that are currently in the market. Full reviews of the NW wines (and scores) will appear in an upcoming issue of Wine Enthusiast. This is as good as it gets in Washington – a dense, pungent, intensely aromatic and gloriously flavorful wine sourced entirely from the Klipsun Vineyard. Inaugural scents suggest wet hay, new mown grass, fig and citrus. Flavors follow, heaping on layers of pineapple, more citrus, beeswax and a suggestion of bee pollen also. This new release of Pearl is as distinctive as Sparkman’s 2011, but offers somewhat different flavors. The precision and detail remain, with a powerful caraway note – like a sniff of fresh rye bread. It’s firm, tart and penetrating, with excellent balance and length. A blend of 75% Sauvignon Blanc and 25% Sémillon, this is a lightly toasty, very flavorful wine, adroitly mixing slight bitter skin flavors, citrus pith and flesh, and a tangy core of grapefruit and pineapple. The length and detail are impressive. Done in a bracing, sappy style, this is a 79% Sauvignon Blanc, 21% Semillon blend, with lush flavors of lemon drop, orange candy and Key lime. It’s ripe and juicy, with a suggestion of beeswax in the mouth. Matthew Loso makes excellent Sauvignon Blanc, and this is no exception. Smooth, lush and creamy, it’s bursting with concentrated fruit flavors of apple, peach and papaya – definitely not a grassy style by any measure. Balanced and grassy, this well-modulated and downright pretty Sauvignon Blanc shows why the winery has been noted for its bottlings of this grape for the past four decades. Finished in screwcap, so there are no worries about getting an off bottle. 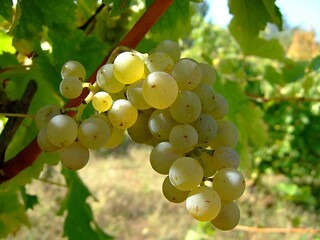 Fumé blanc, a term that supposedly differentiates the winemaking style from “regular” Sauvignon Blanc, is long past its usefulness. Here I suppose it’s just a matter of tradition, for both the Dry Creek Sauv Blancs are entirely stainless steel fermented. This might be considered a reserve, in that it has more concentration, but also more herbaceousness, than the regular bottling. A rare bird is Oregon Sauvignon Blanc, but wines such as this make you yearn for more. As fresh and racy as a bright young Quincy from the Loire, this sappy Sauv has the snap of natural acidity and a tongue-tingling mix of melon, lime and grapefruit on the palate. I've always had good luck with the Guardian "Angel", so that's one of my go to Sauvignon Blancs. I tried the Barons V Sauv Blanc just recently at Taste Washington and again in their tasting room and found it quite nice as well. One of my new favorites is the Columbia Crest Reserve Sauvignon Blanc, but unfortunately I was only able to get one bottle of it before it sold out, so I'm doomed to waiting for the next vintage. One great thing about the Washington Sauv Blancs that I've had is that there are a wide variety of styles throughout the state. Some taste like they could have come straight from New Zealand, while others are done in a more traditional Sancerre style. I'm generally happy with all styles of it, so long as the winemaker doesn't go overboard with the oak.